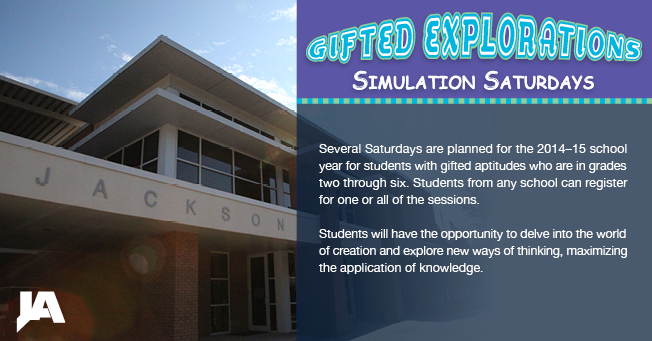 Several Saturdays are planned for the 2014-15 school year at Jackson Academy. Students with gifted aptitudes from JA and other schools have the opportunity to delve into the world of creation and explore new ways of thinking, maximizing the application of knowledge. For the Flight Session, students will be creating an airport simulation. Participants will design an airplane out of paper boxes and will work collaboratively to build a runway/taxi-way and terminal based on information learned from studying aviation design. All of this hands-on learning will enable students to understand how airplanes work as well as what enables airplanes to stay aloft. The Flight Session is designed to instill creativity, synthesis (putting to use what they learned), and divergence (being able to compare and contrast different types of aircraft).